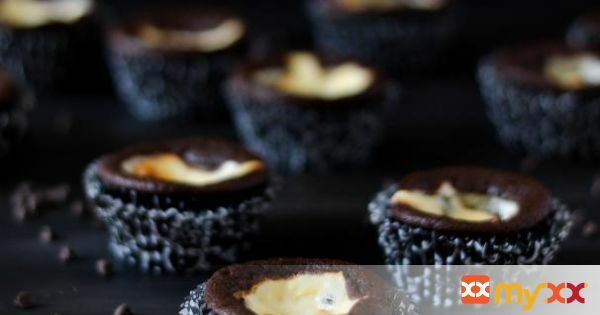 Chocolate cupcakes with a cheesecake center that's studded with chocolate mini chips. 1. Adjust the oven rack to the lower-middle position and preheat oven to 400 degrees f.
2. Line a standard muffin tin with cupcake liners, set aside. 3. In a medium bowl add the cream cheese, 1/4 cup of sugar and 1/8 teaspoon of salt. 4. Using an electric mixer, beat until combined. 5. Add the egg white and 1 Tablespoon of sour cream, beat until combined and creamy. 7. Set aside while preparing the cupcake batter. 8. In a large bowl combine flour, 1/2 cup, plus 2 Tablespoons of sugar, cocoa powder, baking soda and 1/4 teaspoon salt. 10. Make a well in the center of the mixture, add the water, 1/3 c. sour cream, melted butter and vanilla. 11. Whisk until just combined. 12. Divide the batter evenly between the muffin cups. 13. Add a heaping tablespoon of the cheesecake batter right on top of the cake batter. 14. Bake until the tops of the cupcakes just begin to crack, about 18-20 minutes. 15. Let the cupcakes cool in the tin for 10 minutes before removing them to a wire rack to cool completely.